Cleveland’s unusual topography whereby the city is intersected by numerous valleys and ravines, has made it necessary from the earliest days to build a great many bridges-many more in fact, than the average city possesses. Cleveland, in 1918, has fifty-eight square miles of territory. The total area of Cuyahoga County, including Cleveland, is 4653 square miles. According to the county surveyor’s records, there are 105 bridges in Cuyahoga County, exclusive of those that are maintained entirely by the city of Cleveland. Of the 105 county bridges, fifty-three are steel structures, six are of wood, fifteen are of concrete, twelve have concrete arches, and nineteen have stone arches. In the city of Cleveland, there are eighty bridges, carrying highways. The total length of these eighty bridges is approximately five miles. The most expensive bridge in Cleveland is the new Detroit-Superior high level bridge, which is costing the county $5,407,000. The longest bridge in Cleveland is the Clark Avenue Bridge, which has a length over all, including fills, of 6,687 feet, the steel work being 5,992 feet. The shortest bridge in Cleveland or Cuyahoga County is a little structure in the southwestern section of the public square, which is about fifteen feet long. The longest steel arch in the county is that in connection with the Detroit-Superior high level bridge, being 591 feet long. The longest concrete arch is that of the Rocky River span, which is 280 feet long. In addition to the eighty bridges in Cleveland referred to above, carrying highways, there are thirty-seven bridges in public parks. It will thus be seen that there are 222 bridges in the parks, city and county, exclusive of railway bridges, of which there are several score. In the early days, wood was the uniform material used in the construction of bridges. They were heavy, cumbersome structures for the most part, and by no means safe at all times. With the advent of steel and structural iron, new types appeared. Longer spans were provided and efforts at artistic construction were forthcoming. In the late decade or so, the use of concrete has become quite popular, and most bridges are now constructed of that material, steel being used for reinforcing in every instance. A noticeable development of the past few years has been efforts on the part of engineers to produce artistic structures, which, while giving attention to utility, are also of attractive design. This structure is 2,365 feet long and has eighteen arches. the Harvard-Denison bridge, erected under the auspices of Cuyahoga County in 1910. The length over all is 3,233 feet, the length between end abutments being 2,781 feet. It contains twenty-two steel deck trusses, the longest span being 153 feet. The width of the bridge is fifty-six feet, consisting of a forty-foot roadway, and two eight-foot sidewalks. The height or roadway above the lowest point is 100 feet. It has two street car tracks. About 17,000 cubic yards of concrete were used. The amount of structural steel was 12,640,000 pounds, and the amount of steel reinforcement was 700,000 pounds. The concrete piles used in its construction, if placed end to end, would extend a distance of one mile. Its total cost was $527,440. The Harvard-Denison bridge is the largest structure of its kind in the extreme south end of the city, and connects populous business districts in Newburg and Brooklyn. A bridge which has caused a good deal of favorable comment is the Brooklyn-Brighton concrete bridge, constructed by Cuyahoga County in 1916. It is 2,365 feet long, the distance between end abutments being 1,726 feet. It contains eighteen arches, the longest span of which is 139 feet. The bridge is seventy-six feet wide and the height of the roadway above the lowest point is ninety-eight feet. Two street car tracks are provided for. The bridge cost $571,057, and it was necessary to purchase land worth $190,798 as a site. Torn down in 1916. Beneath the large arch at the right, may be seen the original bridge at river level. This steel structure spans the Chagrin River and is 363 feet long. The Rocky River bridge is another large and imposing structure built by the county authorities in 1910. Its total length is 708 feet and the length between end abutments is 586 feet. There are six arches, the main central span being 280 feet long. The bridge is sixty feet wide and the height of the roadway above the lowest point is ninety-four feet six inches. There are two tracks for street car traffic. The bridge cost Cuyahoga County $224,850. Formerly carrying the Lake Shore Railway over Lake Avenue. Every stone was cut from a different pattern. Cleveland’s longest bridge is the one connecting Clark Avenue across the Cuyahoga Valley. It was built by the city of Cleveland in 1917, at a cost of $1,398,000, and has two street car tracks. It is largely of steel construction, 11,173 tons having been used. The total length of the bridge, including intervening fills, is 6,687 feet, the steel work alone being 5,992 feet in length. One of the earliest bridges in Cleveland was constructed over the river at Seneca Street, now West 3rd Street. The city engineer, in 1857, officially reported that the bridge had collapsed, as it had been overloaded with cattle. A new wooden structure containing a draw operated by hand, replaced it. In 1888, an iron bridge with one pivot span of 180 feet and one fixed span of 105 feet, was built. 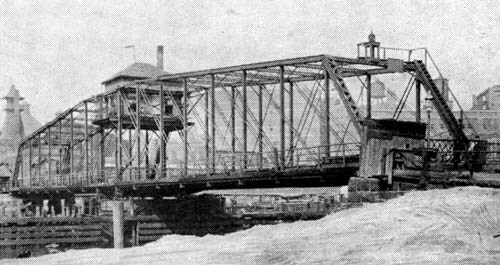 On June 25, 1903, the city completed another new bridge on the same location, it being a Scherzer roller lift bridge, the first of its kind built by the city. It has a roadway of twenty-three feet eight inches wide and two 6-foot sidewalks. South Rocky River bridge at Lorain Avenue. It is 1,219 feet long. This stle is practically obsolete. Formerly located at Irish Road, near Berea. The old Main Street bridge was completed July 3, 1869, being 200 feet long and thirty-one feet wide. 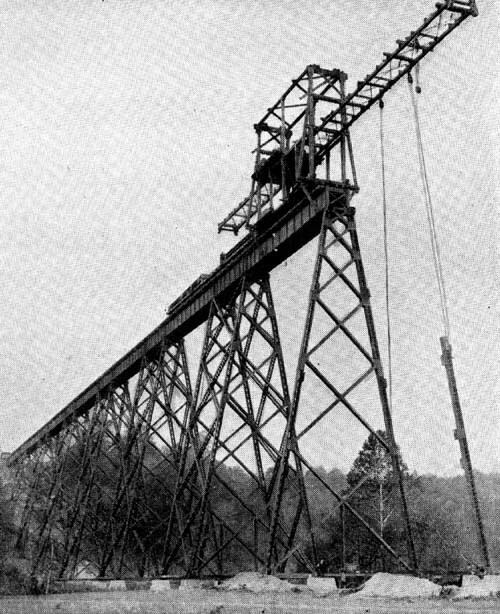 It was rebuilt and operated by steam in 1885, and again in 1915, it was moved over and longer approaches were built to permit large vessels to enter the river. IN 1856, the structure known as the Lighthouse Street bridge, later renamed the Willow Street bridge, was completed. It was replaced by a draw operated by electricity 1898. One of the long bridges in Cleveland which is very well known is the Central Viaduct, which was constructed in 1888. The length of the viaduct proper, spanning the Cuyahoga Valley, is 2,839 feet. 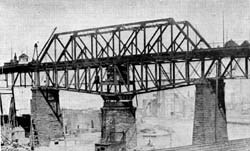 In 1912, the Central Viaduct was converted into a high level structure by having the central pier removed and the old swing draw replaced with permanent steel bridge work. In conjunction with the Central Viaduct, there was built in 1888 the Abbey Avenue bridge, which is 1,092 feet long. This is the kind of bridge the country now builds. It is over the Chagrin River at Wilson Mill's. 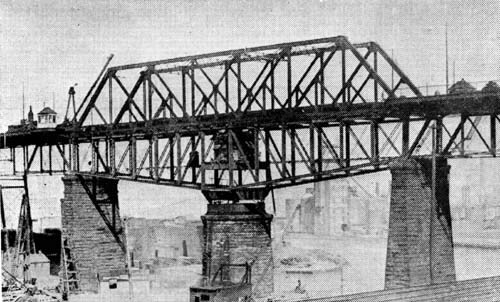 The Center Street bridge, under the new Detroit-Superior high level bridge, was the first to be built in Cleveland and has been replaced five or six times, the last occasion being in 1900, when a steel structure was completed at a cost of $57,000. When built, this was the flattest semi-elliptical arch in the world, and first three-hinged arch built in America. The Kingsbury Run viaduct, now known as the East 34th Street bridge, was completed in 1886 at a cost of $147,580. The Walworth Run bridge was one of the first of the large viaducts built by the city, carrying West 25th Street over the Big Four railway tracks. The present structure was built in 1888, at an approximate cost of $42,1540. In 1911, it was remodeled in connection with the grade crossing work of the Nickel Plate Railway, the southerly end of being elevated and extended. The seven railroads entering Cleveland have built many bridges during the past century, finding it necessary from time to time to replace them with more modern structures. The Nickel Plate Railway has a large viaduct crossing the Cuyahoga Valley, which will doubtless soon be replaced in connection with reconstruction plans. It also has a large steel span across Rocky River. When the Cleveland Short Line Railway, popularly known as the "Belt Line," was built about 1910, it was necessary to cross over under a great many Cleveland streets. Ben F. Hopkins, engineer in charge of the work, states that there are thirty-three bridges, having a total length of 2,683 feet. When Rockefeller and Gordon Parks were improved many years ago, funds were provided for the construction of large stone bridges to carry Wade Park Avenue, Superior Avenue and St. Clair Avenue across the Parkway. These bridges are of imposing and attractive design, as is also the heavy stone bridge which carries the Lake Shore Railway over Gordon Park. This same old structure has stood for nearly sixty years. Cleveland's first three log hunts was built within three hundred feet of this spot. The Pennsylvania Railway, in elevating its lines about 1912, spent several million of dollars in building steel bridges across streets passing under its right of way. the lake front. The B. & O. also has a large jack-knife bridge over the Cuyahoga River, at what was formerly the mouth of the Ohio Canal. The tendency in recent years has been to build more permanent bridges than heretofore. The character of the city having been well established by this time, the trends of traffic have been determined, and bridges are being built for the future, it being believed that there is economy in erecting permanent structures. Many millions of dollars have been spent in bridge structures, and many millions more will be spent. The Cuyahoga Valley imposes great difficulty in the matter of traffic between the east and west sides. It is already spanned by four great structures, carrying general traffic, i.e. the new Detroit-Superior high level bridge, the Central Viaduct, the Clark Avenue bridge, and the Harvard-Denison bridge. A bridge which will be replaced with a more permanent structure shortly is that which carries the Lake Shore tracks across the Cuyahoga River at its mouth. When it is finally determined just how the lake front is to be improved, a new and much larger structure will replace the present one, which has stood there for many years. One more great bridge is already in contemplation, and bonds to the amount of &5,000,000 have been authorized for its construction. It will cross from the intersection of Ontario Street and Huron Road on the east side, to Lorain Avenue on the west side, and it is planned to make it a counterpart of the new Detroit-Superior bridge, although in all probability it will be longer. It is not contemplated that it will be built until after the war. Railroads entering Cleveland had to build high to avoid impossible grades.